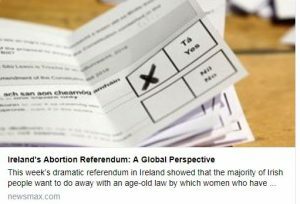 This week’s dramatic referendum in Ireland showed that the majority of Irish people want to do away with an age-old law by which women who have abortions, and doctors who help them do so, could face up to 14 years in prison. But as abortions become legal in Ireland, something far more revolutionary than a change of laws is being born. The transformation taking place in the conservative Irish society reflects the global thrust of liberalization, shattering one social convention after another across modern human society. Day by day, man frees himself from various social frameworks that used to control his thoughts and dictate his behavior. Let’s take a glimpse at history. From monarchies through various dictatorships, to the democracies of our time which continue to change shape in modern times, a natural course of human development becomes evident. The individual is gradually taking over the reins for his/her family and possessions, body and behavior, and all of the components that make up his/her identity. But here is what we can easily miss: Freedom must be accompanied by maturity of the human being, if we are to maintain balance in society. As we relieve ourselves from the chains of the past and march into the future’s freedom, we have to cultivate human awareness to a whole new level. With every limitation that’s being lifted, one should ask himself: How am I connected to other people around me? What is my natural obligation towards them? How do my actions influence everyone else? We are entering an era where answers to these questions will no longer come from clergymen, government officials, laws and regulations, or any institution that aims to dictate people’s way of thinking. Instead, it will come from the inner development of the human being, or if you will, our “spiritual” development. Yet, hoping for positive human development to happen by itself is not what I am suggesting. Rather, I am certain that we need to begin educating ourselves as a society by illuminating existential questions, learning about human nature, and preparing for the interdependent state the world is coming to. In other words, I am advocating an expansion of human awareness in society as a whole. And as a result, the individuals in society will better understand how to conduct themselves towards balance. How does that work? We should take our cues from how nature maintains a “dynamic equilibrium.” When looking at life within the human body, we see contrasts such as heat and cold, organs with various functions, different kinds of germs, active and passive forces, and yet they all work together in balance and reciprocity, complementing each other. It’s the principle of life that works without our involvement. We humans, however, must develop and complement each other consciously and volitionally. Our development as human beings demands us to reach balance and reciprocity at all levels of life. If we won’t develop the ability to do so, giving ourselves more and more freedom may manifest very negatively in the form of terrorism, crime, and other forms of abhorrent behavior. Without the maturity to maintain social balance, we could find ourselves plunging into social-familial-political chaos to the point where one only does what’s right in his own eyes and for his own sake. I believe we will come to see that neither money nor power can drive us to seek social harmony; only education that aims to raise human awareness will help us sense our interdependence and appreciate our common humanity. And the more we develop the human being inside of us, the more we can free ourselves from limitations outside of us.